One of two turtles that was found chained together with voodoo dolls on Miami Beach back in November was released back into the wild Thursday. 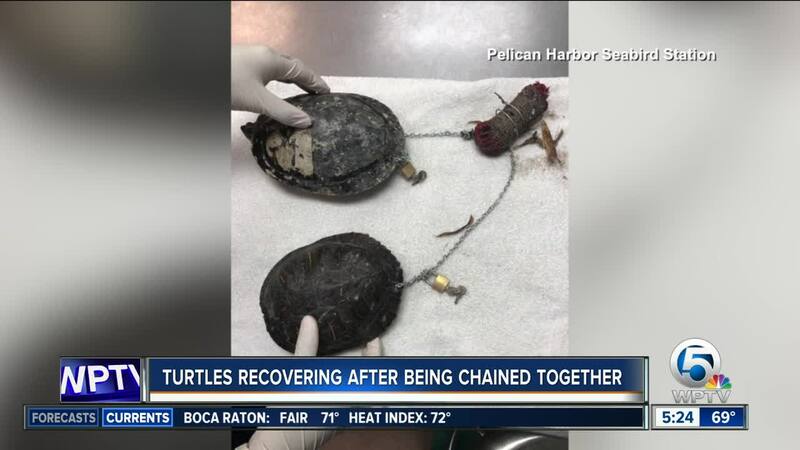 MIAMI BEACH, Fla. — One of two turtles that was found chained together with voodoo dolls on Miami Beach back in November was released back into the wild Thursday. Officials with the Pelican Harbor Seabird Station said the two turtles were found frantically swimming in the ocean in late November. Each turtle had a hole drilled in the edge of its shell and were connected with a chain and lock. On the chain was a mysterious bag that was found to contain two voodoo dolls, cinnamon cloves and two photos of an unknown couple. "We have seen interesting cases before, but I have never seen one like this," Wildlife Rehabilitation manager Yaritza Acosta said. One of the turtles was suffering from a respiratory infection and shell rot and spent 71 days in care before being released at Amelia Earhart Park Thursday. The second turtle is still undergoing treatment. Officials said in recent months an osprey, a vulture and two hawks have come in with gunshot injuries. "It's always difficult when we receive patients that are admitted as a result of animal cruelty. South Florida's native birds and wildlife are to be revered and respected, not shot or chained together," Executive Director Chris Boykin said in a statement.